Duke was with the Filipcichs for 16 years when old age overtook him. After his death, neither Judy nor Joe felt as if they would ever be ready to bring another dog into their family; Duke had been their baby. 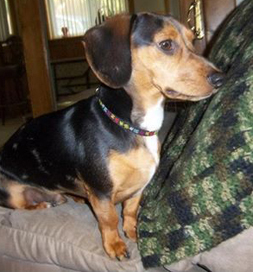 Three months passed before the Niles, OH, woman logged onto Petfinder and entered a search for a young Dachshund. She still thought it was too soon and wasn’t optimistic, but when she saw a doxie named Beanie, listed by the Animal Welfare League of Trumbull County in Vienna, OH, she changed her mind. Bailey brings joy to the Filipcichs. When Judy met him, the quiet little dog snuggled right in against her and put his head on her shoulder. “There was no way I was going to leave without him that day,” she says. Bailey has been a godsend for Joe, who has been diagnosed with early dementia. “He can no longer work, and I’m retired myself,” Judy says. “So our lives have certainly changed over time. After Bailey entered, we’re like two permissive parents. Early mornings, I come downstairs to usually find my husband and Bailey sleeping in the recliner together.” The two of them have game time together when Joe hides treats for Bailey to find. This once homeless dog now thrives in a shower of love and attention.